The Bulldog Club of Northern California was founded circa 1931. The Club was put together by San Francisco bulldog fanciers and its early meetings were in downtown office buildings in that city. The first President was William Draycott (Brian Boru Kennels). The Club had an annual dinner, occasional matches, and contributed trophies to local all-breed shows. It is not known when BCNC's club insignia was adapted from the bulldog head study that was used for years on the Golden Gate Kennel Club's (GGKC) trophies and catalogues. That club had many bulldog fanciers who served as BCNC officers. 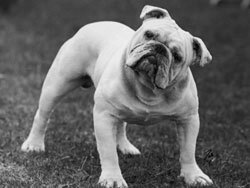 GGKC's use of the bulldog head study ceased about the time of World War II. BCNC remained a parlor-sized organization until after WWII when the years 1947-1950 saw a sudden surge in showing and dog club activity everywhere in the state. In 1948 Club member Mable Fox's famed Zorro Torro kennels burned and all of BCNC's early records were lost. In 1950 the Bulldog Club of America was reorganized and BCNC became a member club in Division III, which consists of Arizona, Hawaii, California, and Nevada. On March 21, 1960, BCNC incorporated in San Francisco and began growing steadily from 40-50 members to today's current strength. By 1970 the Club hosted its first National Weekend dog shows. BCNC celebrated its Golden Decade in Bulldogs in the 1980's hosting the 1987 National shows in San Jose, CA and then again in 2001. The BCNC instituted awards for Service to the Club and Good Sportsmanship with annual perpetual plaques donated by the premier English judge and breeder, Arthur Westlake (Baytor Kennels), from his personal historic collection of bulldog memorabilia. The Club holds an annual specialty show each year (currently in October) and offers trophies and prizes to exhibitors. BCNC also exchanges trophies internationally with a number of bulldog clubsour link to the breed around the worldthese international trophies are awarded at the annual specialty. As a non-profit, BCNC donates funds each year to dog causes which have included: SPCA's, dog legislative causes, victims of earthquakes and hurricanes, and our own Northern California Bulldog Rescue which actively finds homes for, and helps, displaced bulldogs. BCNC is proud of its many long-term members who have helped better the breed through their participation in Club activities. BCNC meets monthly and frequently includes educational offerings in its programs. All meetings are open to interested individuals. The Club creates and sends out a fun and informative monthly newsletter, "The California Bulldogge." The Club offers and suppports activities in conformation, obedience, and rally, along with numerous "just-for-fun" events such as matches, the annual July picnic, winter holiday party, and other enjoyable get-togethers for both pet and show bulldogs. BCNC encourages responsible pet ownership and breed education and urges new bulldog owners to try out our activities. Develop new friendships, gain breed knowledge, ensure bulldog health, and share with like-minded people who are devoted to this wonderful breed. Get involved in the Club, find your niche, share your passion, and help us better the breed. Join today! Original history portion compiled and written by the late B.M. Thackrey. Copyright 1999 - 2014 The Bulldog Club of Northern California, Inc. All rights reserved.